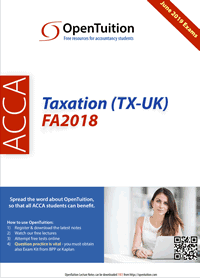 From June 2019 the TX-UK exam will be based on FA 2018 but the lectures that are currently available online are for students preparing for the March 2019 exam and are based on FA 2017. The new FA 2018 Study Notes are now available online with the revised lectures to accompany these notes now being prepared and starting to become available from mid February. Students who wish to start their studies more immediately may however do so using the FA 2017 lectures, but taking account of the information below about changes you will now see in the FA 2018 material and with recommendations as to where to wait for the revised lectures to become available and where subject to advice given, the old FA 2017 lectures may still be used. If any students who have already studied using the FA 2017 material decide to defer their exam sitting to June 2019 then work carefully through the ACCA Examiners Technical Article FA 2018 and purchase an exam kit for FA 2018. There are no technical changes to the content of the chapter but several changes in the rates and allowances to use. Due to these changes and the fact that this chapter is hugely computational it would be advisable to await the new lectures which will be available by February 13th and use with the FA 2018 notes. The basic rate band limitis increased to £34,500 while the higher rate band limit remains at £150,000. In line with the increase in the PA the transferable amount of the PA(Marriage Allowance) is increased to £1,190 creating a revised tax reducer of £238. The increase in the PA also means that in section 3 of the notes on the PA when a taxpayer’s adjusted net income now reaches £123,700 their PA will be reduced to nil. The basis of assessment for property incomehas changed from an accruals basis to a cash basis as you will read in the FA 2018 notes. Once again it would be advisable here to wait until the new lectures are available and use with the new notes – lectures will be available by February 13th. The process of adjusting the accounting profit of a trader to make it acceptable for taxation purposes is a standard area of questioning that will be tested through either objective testing questions or in a written Section C question and is a stand alone learning exercise that can be done without having studied chapters 2 and 3. See Example 17 in the ACCA FA 2018 Technical Article. Due to these changes many of the examples in the chapter have been amended and as it is most likely that cars will be tested in your exam you may prefer to leave this section until the FA 2018 lectures are put online by February 16th. No changes in the rules that apply in determining for an unincorporated trader how for each tax year of assessment the relevant tax adjusted trading profit of the individual will be determined. In Chapter 6 Section 1, it is only the dates in the examples that have changed and therefore the FA 2017 notes and lectures may be used. Await the revised lectures on Chapter 2 before studying the remaining sections from the FA 2018 notes that demand knowledge of the income tax computation from chapter 2. Apart from partnership losses (section 8) this chapter can be studied with the only changes from the FA 2017 notes and lectures being the dates used in the examples. TheFA 2017 notes and lectures may be used here up to Section 7.1(c) but noting that in Section 6 on Exempt Benefits that exemption 6(e) childcare vouchers have now been abolished and the new system is notwithin the syllabus. Section 7.1 (g) on beneficial loans may also be studied from the FA 2017notes and lectures as the rules have remained the same. Although there are no changes in rules to be applied, this is again a very computational based chapter and as thresholds and limits for the calculations have changed, I would advise waiting for the new lectures to use with the FA 2018 notes. The only change from FA 2017 is that the Annual Exempt Amountfor 2018/19 is increased to £11,700. There are nochanges in the CGT ratesfor 2018/19 but as the use of these rates is linked to the figure of taxable income from the income tax computation you need to have studied chapter 2 before attempting the CGT chapters. There are no other changes to CGT. See examples 27 – 30 in the ACCA FA 2018 Technical Article for further question practice. Both these chapters are self study and may be attempted at any time but I would advise working through the other chapters and leave what is mostly a “learning” exercise until closer to the exam and after you are comfortable with the “doing” exercises of being able to prepare all the tax computations. No changes in the rules so again the FA 2017 notes and lectures may be used. There have been significant changes to the carry forward loss reliefs available to companies (albeit the more difficult changes are thankfully excluded from the syllabus) so wait for the FA 2018 lectures before studying this chapter. Wait for FA 2018 lectures. The only change to the FA 2017 notes and lectures is that the Residence Nil Rate Bandis increased to £125,000. 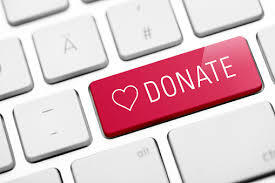 Therefore the FA 2017 notes and lectures may be used here to learn the method and rules for preparing IHT computations but noting that where reference is made to the Residence Nil Rate Band that for FA 2018 we replace the previous £100,000 limit with the new figure of £125,000. See Example 40 in the ACCA FA 2018 Technical Article for further question practice. All the previous chapters need to have been studied with lots of question practice undertaken before attempting study of this chapter. hello the CGT lectures from chapter 12-14 are not available ,or not showing with the rest of lectures can someone advice where to find them ?